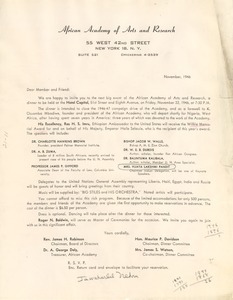 New York (N.Y.) - Addressed to President K. Ozuomba Mbadiwe; regretfully declining his invitation to sponsor the Academy's "African Music and Dance Festival" and pledging to write soon with respect to the upcoming Colonial Conference. 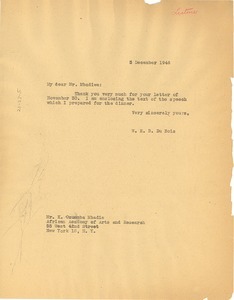 New York (N.Y.) - Addressed to the attention of Mbonu Okike; billing him $50 for the January 19, 1946 address at the American Museum of Natural History. 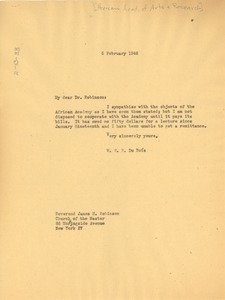 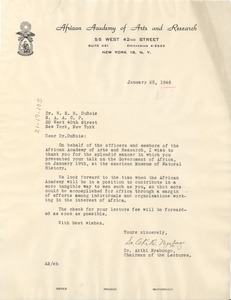 New York (N.Y.) - Signed Akiki Nyabongo, Chairman of the Lectures; thanking him on behalf of the Academy for "the splendid manner in which you presented your talk on the Government of Africa" at the Natural History museum (see mums312-b109-i103 for program) and looking forward to his future contributions to the Academy's efforts. 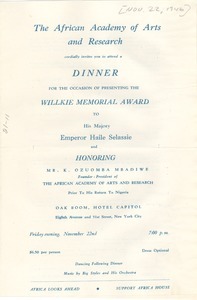 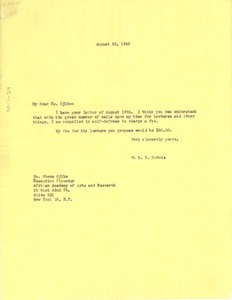 New York (N.Y.) - Addressed to Mbonu Ojike; thanking him for the invitation to lecture before the Academy and noting his "self-defensive" $50 speaking fee. 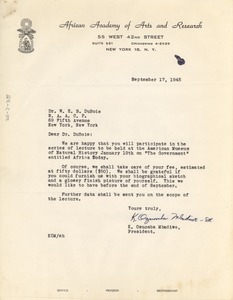 New York (N.Y.) - Signed K. Ozuomba Mbadiwe, President; seeking to confirm the date, fee, and topic of his forthcoming address on "The Government," and requesting he send a biographical sketch and glossy photo for publicity purposes. 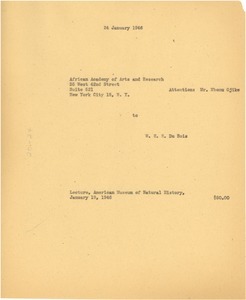 New York (N.Y.) - Addressed to James H. Robinson; refusing to cooperate any further with the Academy until he receives the $50 payment owed to him on the occasion of his January 19 lecture. 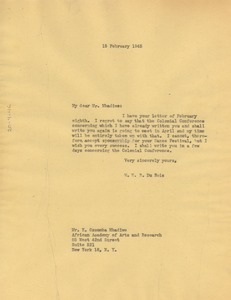 New York (N.Y.) - Signed Rev. 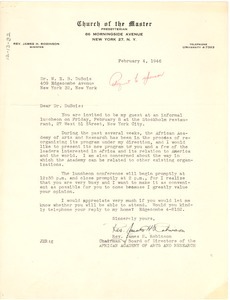 James H. Robinson, Chairman of the Board of Directors; inviting him to a formal luncheon in New York in order to "present [the Academy's] new program to you and a few of the leaders interested in Africa."